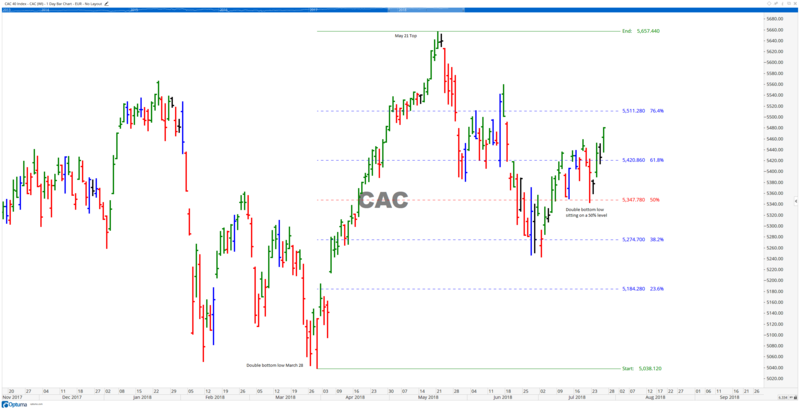 The daily chart for the CAC index from France shows a major double bottom low March 28 up to a new top May 21. this is a perfect range to use the Fibonacci retracement tool, and we see a fabulous example recently of a bullish pattern, The double bottom low above a low. When this is sitting on the half way point between the last major top and low, it is a very powerful signal to educated traders. This suggests the market should run higher, and as we can see it has done just that. You can right click and download the chart for another fabulous example of combining the Fibonacci series with our technical analysis knowledge.